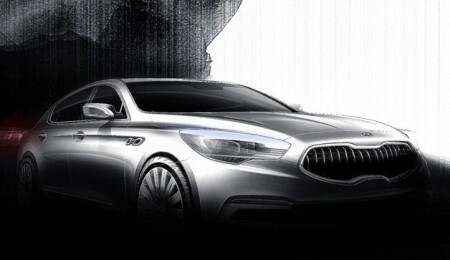 The South Korean automaker Kia has published several photos of their upcoming sedan, which is currently titled as KH. Comparing these sketches with the recent spy shots, we can note the most interesting details. Among them are completely new LED lights, as well as the notes of the design that the car borrowed a model Optima and the concept of GT, which debuted for another auto show in Frankfurt. It is expected that the model of KH will be collected on the same rear-drive platform as the Hyundai Genesis. So far, the Koreans did not report any details on the car's engine. However, the logical step would be for them to use 3.8-liter six-cylinder from Hyundai, as well as 5.0-and 4.6-liter eight-cylinder. But coming back a little bit ago, it is worth remembering, one hundred and six-cylinder equipped with the GT concept twin-turbo, created especially for him. It would be interesting to see a brand new Kia car with previously used engine.